Tirunelveli Sonerila is an erect subshrub, 12-30 cm tall, with stem woody below, more or less branched, nodes slightly swollen; twigs round, hairless, the youngest red. Leaves are opposite, 4-11 x 1.2-2.7 cm, lanceshaped, usually narrowly so, tapering, base wedge-shaped, thinly membranous, very unequal sided, one side always pointed, the other pointed or rounded, margins distantly sawtoothed, serrations usually tipped with a short bristle. Leaf-stalks are slender, 1.5-4 cm long, hairless, red. Flowers are borne in racemes in leaf-axils and at branch-ends, few to 30 flowered. Cluster branches are red. Flower-stalks are 4-5 mm long, red when young, calyx narrowly funnel-shaped, 4-6 mm long, shallowly 6-ribbed, teeth, short, broadly triangular, pointed. 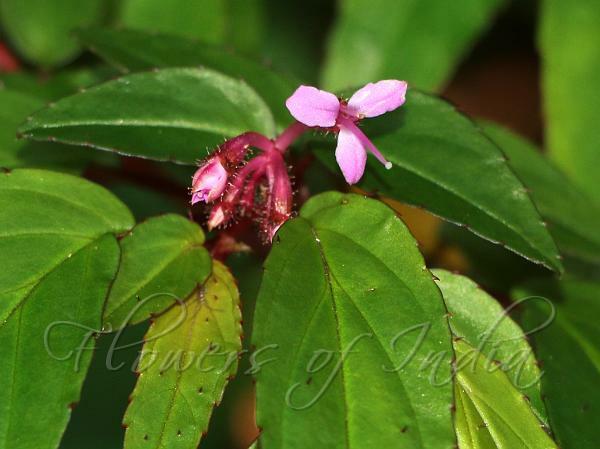 Petals are 3, ovate-lanceshaped, pointed, 5-6 mm long, pinkish-mauve, veined, hairless on the upper surface. Stamens are 3, hairless; filaments slender, erect, 2.8-4 mm long. Style is linear, slender, 8-9.5 mm long. Capsule is funnel-shaped, thinly corky, 5.5-6 mm long, pale-brown, shining. 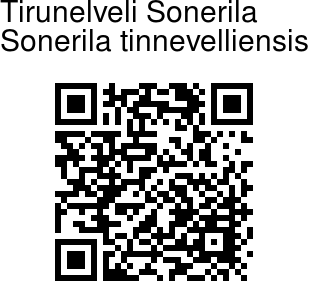 Tirunelveli Sonerila is endemic to Southern Western Ghats.